MN Supreme Court: "Election Fraud OK with Us"
In a not unexpected result to the contested election between Senator Norm Coleman and comedian Al Franken, the Minnesota Supreme Court today declared Franken the victor. Minnesota has a history of making elections into a big joke, the last memorable example being the election of Professional Wrestler Jesse "the Body" Ventura as Governor. However, even in practical joke loving Minnesota, a healthy dose of election fraud was required to give Franken enough votes to carry the day. In the days following the election, which originally showed Norm Coleman as having won a narrow victory, extra votes for Al Franken showed up in the most unlikely places. Nearly everyone I know has a story of finding at least a few Franken ballots. I even found a dozen myself, when I disassembled our snow blower to replace the belt. Those of us who find ourselves to the political right of Joseph Stalin, and so did not vote for Franken, can take solace in the fact that we have not lost a conservative in Norm Coleman. In reality we have only traded in a liberal Senator for an extremely liberal Senator. Psalm 1: Blessed is the man that walketh not in the counsel of the ungodly, nor standeth in the way of sinners, nor sitteth in the seat of the scornful. But his delight is in the law of the LORD; and in his law doth he meditate day and night. And he shall be like a tree planted by the rivers of water, that bringeth forth his fruit in his season; his leaf also shall not wither; and whatsoever he doeth shall prosper. The ungodly are not so: but are like the chaff which the wind driveth away. Therefore the ungodly shall not stand in the judgment, nor sinners in the congregation of the righteous. For the LORD knoweth the way of the righteous: but the way of the ungodly shall perish. The man who chooses not to walk in the counsel of the ungodly is blessed. Blessed by God. But what does it mean to walk in the counsel of the ungodly? Obviously the ungodly are those who do not follow God. They do not acknowledge him as their Lord or their Sovereign, or their Savior. Such a man follows his own heart to lead him to do what is right in his own mind. But the Bible tells us that man’s heart is not a good or proper judge of right and wrong. In fact it says in Jeremiah 17:9 that "The heart is deceitful above all things, and desperately wicked: who can know it?" And yet, if a man does not acknowledge God, then he is left with nothing but his heart to guide him. The man who is blessed will not follow after this ungodly man’s counsel. This blessed man is one who does not stand with sinners, in fact he will stand against sin. He cannot ignore sin, and he cannot join himself to the scornful, or those who scoff at the idea of an all powerful God. In other words he will not "go along to get along." Why, you might ask? The answer is in verse 2. Because "his delight is in the law of the LORD and in his law doth he meditate day and night." A man that delights in God’s word, and spends his time reading it, pondering it, and reflecting on it, will have little trouble avoiding the pitfall of following after the urgings of the wicked. This blessed man’s soul will be sustained by that meditation in God’s word. Just as a tree planted next to a river will never be in want of life sustaining water, so too will the blessed man be continually refreshed by God’s word. In John 4:14, Jesus says " But whosoever drinketh of the water that I shall give him shall never thirst; but the water that I shall give him shall be in him a well of water springing up into everlasting life." One of the signs of a healthy tree is that it bears fruit. This Psalm states that one of the signs of a healthy Christian is that they will bear fruit. He "bringeth forth his fruit in his season." If a Christian is keeping close to God’s word, reading and meditating on it, then he will undoubtedly bear fruit. In fact, in Matthew 13:23, Jesus when expaining the parable of the soils, says "But he that received seed into the good ground is he that heareth the word, and understandeth it; which also beareth fruit, and bringeth forth, some an hundredfold, some sixty, some thirty." "His leaf also shall not wither;" another sign of a healthy tree is that its leaves stay green and healthy. Often withered leaves are a sign of lack of water. The same is true of the Christian. A regular partaking of that life sustaining water, which is the Word of God, will keep the Christian fresh and spiritually healthy. The ungodly man is just the opposite. He cares nothing for the Word of God, and so without its nourishment, he dries up in short order and is blown away by the wind like chaff. Because there is no root or anchor to hold him, the ungodly man will not stand in the judgment. He will be found guilty. Since he has rejected God, rejected Christ, he has no righteousness except his own righteousness. But in Isaiah 64:6 it says: "But we are all as an unclean thing, and all our righteousnesses are as filthy rags; and we all do fade as a leaf; and our iniquities, like the wind, have taken us away." Can you see how well that fits in with Psalm 1? This Psalm also tells us that sinners shall not stand in the congregation of the righteous. What exactly is this "congregation of the righteous." If we go back to Isaiah we see that our own righteousness is no righteousness at all. But there is a righteousness available to us. Philippians 3:8-9 "Yea doubtless, and I count all things but loss for the excellency of the knowledge of Christ Jesus my Lord: for whom I have suffered the loss of all things, and do count them but dung, that I may win Christ, And be found in him, not having mine own righteousness, which is of the law, but that which is through the faith of Christ, the righteousness which is of God by faith:"
The only ones that can truly be called righteous are those to whom the righteousness of Christ has been imputed. In the same manner, even though we are aware that we are all sinners, in the context of this Psalm, "sinners" is used to denote those who cannot claim Christ’s righteousness. So you see, "the congregation of the righteous," is an assembly of Christians; a gathering of the Saints. Now this could be a Church, but in this case I believe the Psalm is speaking of heaven. It says that sinners will not stand in this congregation. The New Testament makes it clear that not all who claim to be Christians really are. Jesus told a parable of the wheat and the tares. In Matthew 13:30 he said "Let both grow together until the harvest: and in the time of harvest I will say to the reapers, Gather ye together first the tares, and bind them in bundles to burn them: but gather the wheat into my barn." It seems that at this point in time, sinners do indeed stand in the congregation that we call a Church. But it will not be so in heaven. Those who have Jesus Christ as their Savior will finally be forever free from their sinful flesh, and those who do not will be in hell. There will be no sinner standing in that heavenly congregation! "For the LORD knoweth the way of the righteous: but the way of the ungodly shall perish." 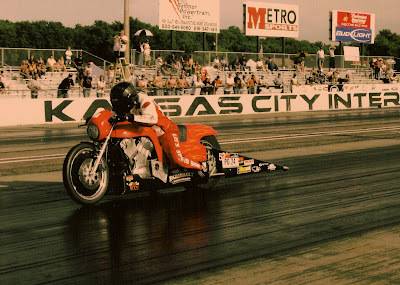 There has been some speculation recently as to whether Joe Lieske's drag bike, nicknamed "The Disruptor," might now be the world's fastest Harley V-Rod drag bike. To date his best pass has been an 8.684 et and 150.21 mph in the quarter mile. Some of the guys I know who are deeply involved with the sport say they have not heard of anyone going faster or quicker on a V-Rod. A superficial check of the Internet by yours truly failed to turn up anything. The way I figure it, the quickest way to find out if anyone else can lay claim to the title is to just put it out there. I have little doubt that someone will speak up if they have gone faster. By the way, if you have one faster, you might want to speak up pretty soon. Joe is shopping for a nitrous oxide kit for The Disruptor and those times will likely change. Thought I would post a few pics of the progress on the nostalgia drag bike engine build. 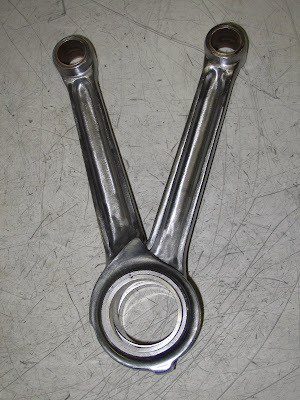 "XA" rods were clearanced for stroke and polished before being shot peened. Longer stroke necessitated cutting down the O.D. of the flywheels for piston skirt clearance. 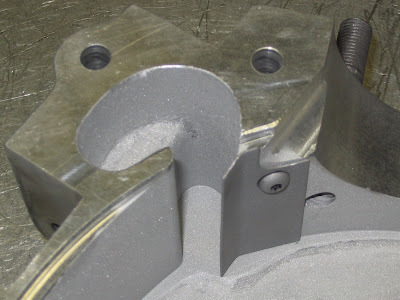 This in turn required a flywheel scraper modification that I chose to do by attaching a formed steel plate rather than the traditional weld and machine method. 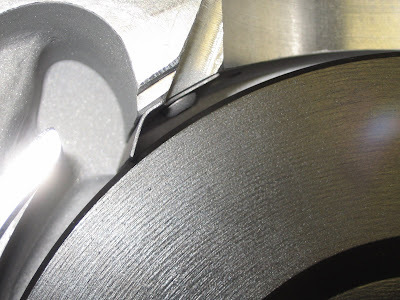 Flywheel half in crankcase, showing scraper clearance. Black flywheel color is from an oil shedding coating. 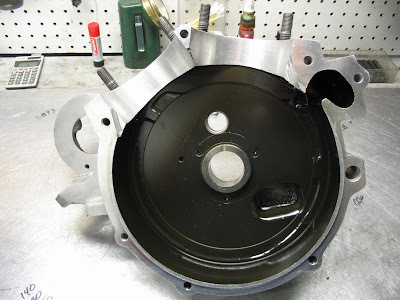 Same oil shedding coating in crankcase. At this point all stroker clearancing is done, the rods are rebuilt, the flywheels balanced/assembled/and trued. 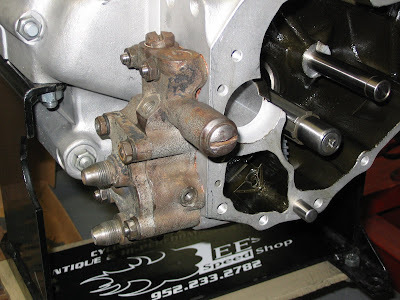 The crankcase halves are assembled, the oil pump installed, the breather timing blueprinted, the cam and circuit breaker drive gear are installed. The tappet bodies have been lightened and installed. 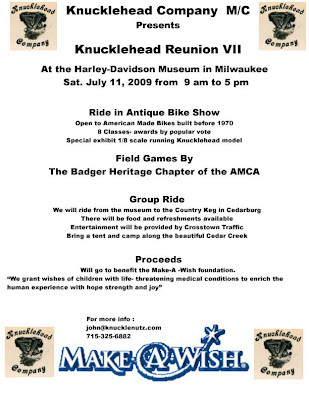 I recently received an invitation to display "The Knuckledragger" at the bike show portion of the Knucklehead Reunion. It should be a great event, and I am flattered to have been invited. This verse comes into my mind on an almost daily basis. The most recent was just this morning when I read a comment on one of my recent posts called "Murder" The anonymous commenter said "Who says anyone of us can pass judgement upon a person? Abortion should be the choice of the woman who needs to decide what's right for her. Politicians and religious fanatics need to mind their own business." In other words, a woman having her baby murdered is good, but someone opposing that murder is evil. And that brings me to another point. How is it that most of those who are pro abortion are also anti death penalty? It boggles the mind, and is perhaps the personification of what Isaiah 5:20 is talking about. There has to be something really twisted in the mind of someone to affirm murdering an innocent but to rail against executing the guilty. Or could it be that, rather than applying rational thought, they just choose to oppose whatever God's word says. 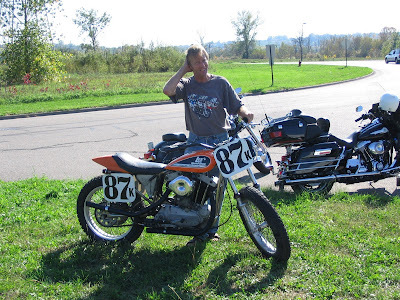 This Monday morning when I got into the shop, there was an message on my answering machine from Bill Hofmeister thanking me for the work I had done on his iron head XR. It seems that Saturday night he ran the Vintage Twin Class at the flat track races in Cambridge. Bill managed to lap all but two of his competitor's bikes TWICE! Bill is an absolutely great rider, and I chalk up most of that success to his ability, but I would still like to think that without my porting he would have only lapped them once. AP - WICHITA, Kan. - Late-term abortionist, George Tiller, has been shot and killed at his church in Wichita, Kansas. A suspect is now in custody. His attorney Dan Monnat, says Tiller was shot as he served as an usher during Sunday morning services at Reformation Lutheran Church. Monnat said Tiller's wife, Jeanne, was in the choir at the time of the shooting. A clear case of a cold blooded murderer being murdered by a cold blooded murderer. What I found most striking though, was that this monster (Tiller) was apparently a member in good standing in what passes for a Christian church. What that says about the state of so-called Christianity in our country today is far more unnerving to me than his assassination by another (albeit a lesser) murderer.